The Story Behind Graham Nash's "Our House"
To celebrate Graham Nash’s birthday today, here is the story—in his own words—behind the classic “Our House,” one of the sweetest love songs ever written. Happy birthday, Graham! “I came to live in America in 1969 and stayed with David [Crosby] for a couple of nights. He threw me a party and invited Joni [Mitchell] whom I hadn’t seen since meeting her when I played with the Hollies. After that party I went home with Joni and spent a couple of years with her in her home in Laurel Canyon. “One day Joan and I got up and went to breakfast at a delicatessen on Ventura Boulevard, and a few doors away there was a little antique store, and in the window Joan saw this vase, went inside, fell in love with it, bought it and brought it back to the house. “It was a kind of a cold gray morning as it sometimes can be in Los Angeles, and I said, ‘Why don’t I light the fire and you put some flowers in the vase that you just bought.” So she’s cutting stems and leaves and arranging flowers in this vase, and I’d lit the fire. Now, my and Joan’s life at the time were far from ordinary … and I thought, ‘What an ordinary moment.’ Here I am lighting the fire for my old lady and she’s putting flowers in this vase that she just bought. And I sat down at Joan’s piano and an hour later, ‘Our House’ was written. Thanks Graham , for the best songs of my life. Your music saved me it’s the sound track of my family . Happy birthday Graham, you bring me peace , hope that for you also. I highly recommend reading Graham’s autobiography “Wild Tales”. It’s a very honest read that doesn’t have all the garbage that so many other musicians have put out. He deals rather extensively with his relationship with Joni. I can’t believe this was so many years ago! It’s like yesterday! Could have been Feb. 3, 2016! It would be to have a large audience singing the chorus to the song…the music of my youth and life. I met Graham Nash while he was with the Hollies – 1966 – came to the record store where I worked. The Hollies were in town for a concert. We knew they were making a stop at the store . . .on cue . . .when they walked in . . .I dropped the needle on the turntable . . . to play Bus Stop for them . . . Nice memory for me. A half-century gone by in a flash! Well, you might especially dig this youngster’s song-stylings, then (I just chanced upon this vid today– I posted a comment as “nuthineatholl”): https://www.youtube.com/watch?v=GTXqKSMv8Lc Cheers! 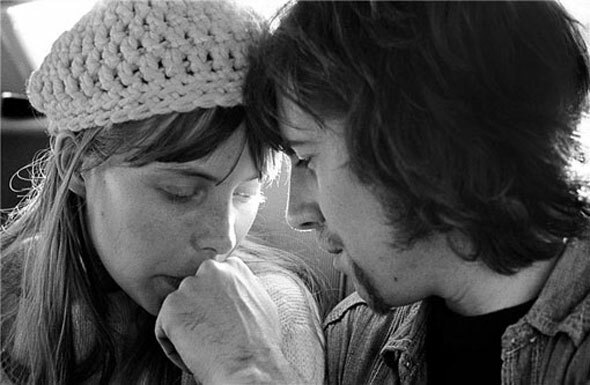 Henry Diltz’s iconic photograph of Joni and Graham Nash embodies every feeling of warmth, young love, and hope that we felt in those wonderful years. Thanks for reminding us, as you have always done, Lydia, of the power and feeling of music from the soul, and heart. Quite a journey you have shared with us. I’m a British guy and have been a CSN fan since the beginning – hated the Hollies but loved the BYrds when I was at school…driving the Pacific Highway and staying the night in Santa Barbara for the first time. Wondered if Graham had ever lived here and Googled him, hence finding this web entry. Great song, brought back happy memories… Happy Birthday, Graham, and bet you’re glad you left The Hollies! Thank you for the fast reply! I have been studying rock lyrics and history as a hobby for over 40 years and every now and then I become stuck on some very obscure pieces of information. The knowledge really helps me connect to the music when I listen to it and these are some of my favorite artists. Jeff — I remember Henry Diltz told me the song she was writing that day was “Willy” which is about Graham (William is his middle name). Great song! Thanks! There is another picture of Joni and Graham in the car on the way to Big Bear lake and she is writing a song on a yellow pad of paper. Do you know what song Joni was writing in that picture? I read about it somewhere but do not remember the song name or where I first read about they enlarged the image and could read the lyrics. Great story, wonderful video. I sang along and started to cry when the whole audience came in with them. A lot of love here. Thanks, Lydia, for bringing out this iconic song. It never fails to tweak my senses and remembrances of a lovely time. Grahams’s story makes it so real and uncontrived. Oh, how I love to hear the story behind the rhyme! Some nice quotes from the great Graham Nash here. He certainly does touch people’s hearts to this day and I would love to see C/N, CSN or just plain N again soon. God bless Graham for not burying his talent in the sand but having it return a thousand-fold! I hope Graham’s birthday brings him as much joy as he has brought me for the past 40+ years. In times of happiness or when I am feelin down, his and CSN music has brought me peace and solice. May he celebrate many many more.